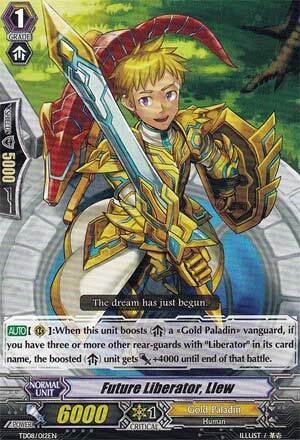 AUTO](RC):When this unit boosts a «Gold Paladin» vanguard, if you have three or more other rear-guards with "Liberator" in its card name, the boosted unit gets [Power]+4000 until end of that battle. ...so essentially, this is the 10,000 Vanguard booster for Liberators. It's not bad at first glance, but there's a wording problem on him: his effect goes when there are 3 or more OTHER Liberator rear-guards meaning that you practically need a full field to have this go off. Personally, Llew should've just kept his Critical Trigger; at least he'd be a little useful then. Next Time: ...really?! Another version of this?! It's Dark Magician all over again!